Welcome to our new Economic Development website!! We hope you find this site very informative when looking at opportunities in Tilton, Illinois. 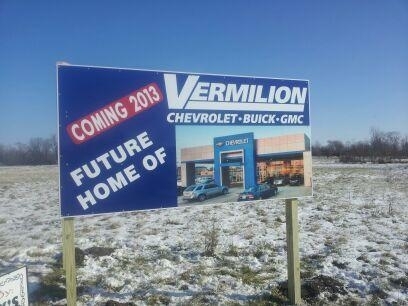 The new Vermilion Chevrolet - Buick - GMC dealership is set to be completed in 2013.
the Village its current title as the "Town of Tilton”. It is said that the name Tilton came from a Mr.
Charles Tilton, a friend of Abraham Lincoln, who worked for the railroad. small town lifestyle that so many residents have become accustom to. over 175,000. 2017 population projections show stable population levels for the region. is less than 100 miles east. Georgetown Road at Big R – 25,000 cars per day; Interstate 74 at exit – 32,000 cars per day. incentives to help in the attraction and retention of new and current businesses. University of Illinois located within its region.